At BodyComp, we use the GE Lunar DEXA Scanner as our method for whole body composition testing because we believe you should be able to access the best of body composition quantification at an affordable price point, which we offer at roughly 30% of the $150, national average. We took the road less traveled to bring you the best and we continuously strive to offer you a knowledgeable, friendly team, responsive customer service, and acceptable experience. If you are pregnant or think you may be pregnant please contact us at support@body-comp.com prior to booking an appointment. Refrain from eating solid foods for 1-2 hours prior to your scan. Both mobile DEXA scans and storefront DEXA scans yield the same results such as visceral fat, body fat %, lean mass, fat mass, total body bone density, and more. Both also include a report review and an account to access your results. Book an appointment at one of our Mobile DEXA Scan locations, which are generally hosted at a gym, health club, corporation, CrossFit Box or other. Some are open to the public some are not. Book an appointment at or buy credits for our San Diego, Sorrento Valley storefront. Purchase an eGift card. Discover just how convenient, quick, and comprehensive body composition testing can be. One of our most popular packages, which is offered for our mobile locations and our storefront locations. Buy credits, they automatically post to your account as ‘booking tokens,’ which you can use at your leisure. Your best bang for your buck. You can share this package with another person if you’d like. The credits post to your account and can be used as booking tokens so you can book appointments at your leisure. Add a VO2 Max and an RMR Test in with your DEXA body composition scan and get the most comprehensive metabolic profile that we offer. Use this data to set goals, fuel, eat, and train more efficiently and effectively. Whether you visit one of our mobile DEXA scan locations or our storefront, we will lay you comfortably on your back, fully-clothed for a 5 – 10 minute, head-to-toe, full body scan. 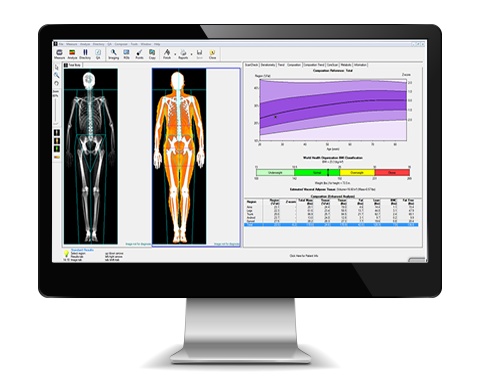 Once your scan is complete, our enCORE software analyzes and organizes all of your 50+ metrics into a comprehensive pdf report, which we upload to your BodyComp account so you can access your results at your leisure. We do offer a report review so you can ask questions as well! 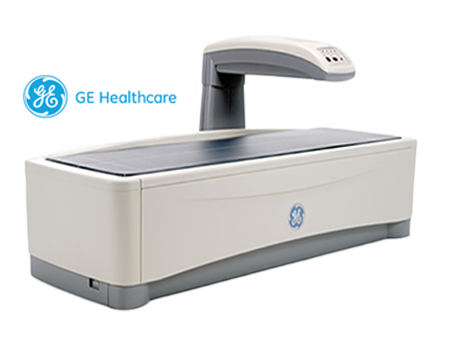 Our GE scanner is capable of 15+ measurements such as DEXA Bone Density, AP Spine, Lateral Spine, Dual Femur, etc. but we use it primarily for body composition testing and analysis. In any measurement, our equipment quantifies either bone or tissue or both (Bone, Fat, and Lean Tissue). One of the only 3 component models on the market. Your top line metrics are Body Weight, Body Fat %, Fat Mass (lbs), Lean Mass (lbs), and Bone Mineral Content (BMC). See all other metrics in our sample report. How much x-ray does a DEXA total body scan use? A DEXA Body Composition Scan from our General Electric, Lunar unit has 3 scan modes: thin, standard, and thick, which are automatically deployed depending on the height and weight of the person. Note: our scanner has a 350 lbs. weight limit. Not because it can’t handle a weight more than that, but because it doesn’t have enough power to quantify that volume of tissue. Standard is the most commonly deployed setting for the adult population and has the equivalent x-ray output of 0.4 Micrograys. (A little more than a TSA airport scan). Everyone metabolizes tracing substances such as imaging dye for a CT Scan or MRI, which typically leaves the body within a week. If you have had a procedure that involved a tracing substance, we recommend you wait at least 5 days to come in for your appointment. BodyComp, Inc. DEXA scans enable whole body and regional body composition quantification of the bone, fat, and muscle tissue that makes up your body. Visceral Adipose Fat (VAT) is the ‘bad fat’ that surrounds and infiltrates your organs in your inner abdominal cavity. It is scientifically tied to common health issues such as diabetes, heart disease, and other cardiovascular and cardiometabolic disease risks. We are able to show you how much if any, Visceral Fat you have in both pounds (lbs) and cubic inches for volume as well as where your basis risk level currently lies. Our full body DEXA scan measures and quantifies the total pounds of fat throughout your entire body. Because fat tissue is segregated from lean muscle mass, organs, and bone mineral content (BMC) you can count on an accurate and precise body fat percentage. Your body’s fat tissue is also broken down into 5 primary body regions, arms, legs, trunk (torso), Android (lower abdomen), and Gynoid (upper thighs and hips) so you can understand how each segment is comprised. Lean mass is two things: muscle and organs; the components in our body with the most metabolic significance or ability to burn calories. Lean mass is measured and quantified just like body fat with respect to the total body and regional quantification. The real value DEXA brings to the table is the precision of muscle measurement, which in return generates a realistic resting metabolic rate (RMR) value. If your muscle measurement is off by 10 pounds, that can make a considerable difference when considering your caloric intake. This is a game changer vs. alternate body composition testing methods. Because DEXA has a clinical origin and scientific validation it is widely deployed in professional healthcare centers across the globe where it’s used most commonly for performing DEXA Bone Density to assess Bone Mineral Density (BMD). BMD is the indicator for Osteopenia or Osteoporosis. 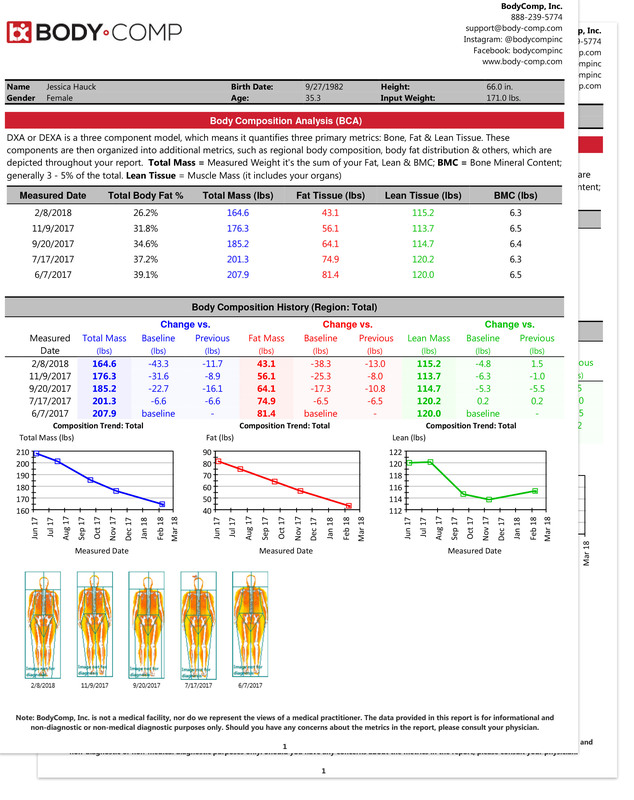 At BodyComp, Inc. we include Total Body Bone Mineral Density (BMD), which can be viewed as a predictive indicator for BMD issues but should not be compared apples-to-apples to a dual femur or AP spine. In addition to the aforementioned, core metrics that our GE DEXA system is designed to offer, there are several more you’ll get on your report. We put our geek faces on and custom engineered an all-inclusive report that certainly doesn’t come out of the box. Therefore, we include just about everything we can get from a single full body scan. Those other metrics include but are not limited to Muscle Balance (Right vs. Left), Resting Metabolic Rate (RMR), Total Body Bone Density (BMD), Android / Gynoid Ratio (A/G Ratio), tracking and trending for regional muscle and fat measurements over time, and Relative Skeletal Muscle Index (RSMI). You can expect accuracy, precision, comprehensiveness, a knowledgeable, and friendly team when you choose a BodyComp DEXA scan. We pride ourselves on customer service and strive to be as helpful and responsive as possible. There’s no value in getting it close or hoping that your comparative analysis is correct. Our machines are designed to be precise so you can know, without a doubt, what is changing from point A to B. We guarantee reliable results. There’s really no way to conduct an inaccurate scan because if there’s something slightly wrong with the mechanics of our systems, they will generate error codes and literally won’t work. Although some people don’t like their results, rest assured, we pay a pretty penny for this equipment and the ongoing maintenance contracts to ensure we run a tight ship. See how your body composition data metrics fluctuate over time providing you an effective tool for validating the effectiveness of your exercise and nutritional programs. We refer to repeat scans as a comparative analysis so you can see how your body is fluctuating over time, between appointments. It’s motivating for many of our customers to see their data points side-by-side and put some number next to their sweat equity. Based on our experience and data, 60-90 days is the most beneficial time to elect a repeat assessment. Additional data points enable additional conversation around the exercise and nutrition components that you have been putting in place since your last appointment. It’s quick, easy and convenient! There’s no special clothing required, you don’t need to get wet, put on a cap or get inside a tank or pod. Instead, you lay comfortably on your back for a quick 5 – 10 minutes. Our customers come to us for common objectives. It’s safe to say everyone wants to gain the best understanding of their body composition to make better-informed decisions, but many times their specific application is unique. Sometimes they are most interested in physique or weight loss. Other times, they are most interested in losing weight to compete in a different weight class or gaining muscle to perform better. No matter your objective, we are here to provide you the best body composition baseline you can get at an affordable price point. Your full body DEXA scan will last between 5 – 10 minutes depending on your height and weight. We will position you on your back, fully-clothed for a quick power nap while we map your body pixel-by-pixel for a comprehensive snapshot of your body composition. Our mobile DEXA truck runs at 12-minute intervals and our storefront at 15’s. It’s safe to allocate between 15 – 20 minutes for your entire appointment depending on how much time you spend reviewing your report with one of our team members. You can really wear anything such as gym clothes, business, casual, or formal as long as there are minimal metal components such as zippers and buttons. Metal is denser than bone, so there’s always a chance it could slightly inflate your BMC. It’s best to fast from solid foods for an hour or so prior to your scan. Liquid hydration is okay in normal amounts. It’s a density model, therefore, if you consumed, for example, a 16 oz. steak right before your scan, it may come across as an extra pound of muscle in your gut. Normal hydration is best and is our recommendation. Hydration can easily be gauged by your urine color – the darker the color, the less hydrated you likely are. The DEXA scanner will accurately and precisely measure whoever we lay under it, which naturally includes physiological fluctuations, therefore it’s best to keep hydration as consistent as possible. Your report will be available for review once your scan is complete and you can expect it to be uploaded to your BodyComp account within 5-10 minutes so you can access at your leisure. We provide you several ways to view and track your metrics over time in addition to your digital pdf report. Get your BodyComp DEXA scan from the following options..